Linda Dryden, Joseph Conrad and H.G. Wells: The Fin-de-Siècle Literary Scene (Basingstoke: Palgrave Macmillan, 2015). £55. 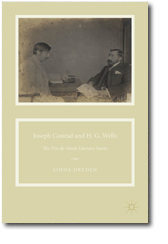 H. G. Wells was one of the first writers to recognize Joseph Conrad’s talent. Reviewing Almayer’s Folly in 1895, Wells pronounced it “exceedingly well imagined and well written”, and predicted that Conrad would attain “a high place among contemporary story-tellers.” But, as Linda Dryden explains in her important new study, it was Wells’s unsigned review of An Outcast of the Islands in the Saturday Review the following year that catalysed their relationship. Conrad wrote to thank the anonymous reviewer “for the guidance of Your reproof and for the encouragement of Your commendation” (CL 1 278-9). After Wells replied, Conrad declared his surprise at the reviewer’s identity to Edward Garnett: “May I be created alive like a miserable moth if I suspected it!” (CL1 281). A letter to Wells himself followed shortly afterwards, praising Wells’s The Time Machine (1895), The Wonderful Visit (1895), and The Stolen Bacillus and Other Incidents (1895). What followed was a relationship of ups and downs, which are charted in detail in Dryden’s opening chapter. The ups included When the Sleeper Wakes (1899) in which “The Heart of Darkness” is envisaged to be among the stories still in vogue in the year 2100, and The Secret Agent (1907), with its elegant dedication to “the chronicler of Mr Lewisham’s love/the biographer of Kipps and/the historian of the ages to come.” Among the downs were Wells’s lack of enthusiasm for Nostromo (1904), Conrad’s disquiet at the ethical implications of some of Wells’s futurological visions, and what appears to have been a sudden and irreversible breach some time around 1909. Although Conrad enjoyed longer and more intimate relationships with others, notably Ford and Galsworthy, the influence of Wells on Conrad and vice versa is significant – so much so that it is perhaps surprising that this topic has never before been covered at length. As Dryden carefully demonstrates, Wells was deeply impressed by “Heart of Darkness,” and an entire chapter of his masterpiece Tono-Bungay (1909), entitled “How I Stole the Heaps of Quap from Mordet Island,” is an extended piece of Conradese which alludes to that novella and also to Nostromo. If Conrad were gratified by this, he would presumably have been rather less pleased by the role in the chapter of the Roumanian [sic] captain whose articulate but ill-pronounced English, claims of aristocratic descent, nervous gestures and elaborate courtesy amount to a cruel portrait of Conrad. (As several critics including Dryden have pointed out, Wells’s recollections of Conrad in his Experiment in Autobiography (1934) confirm that Tono-Bungay’s captain is based on Conrad.) Dryden is especially good at unearthing some unexpected allusions to Conrad’s fiction in Wells’s works, including in his late novel The Bulpington of Blup (1933) which, astonishingly enough, takes aim explicitly at The Inheritors (1901), that “dead, witless book.” Quite why such a minor work should preoccupy Wells so long after the event is a mystery that Dryden notes but does not explain. On Conrad’s part, there is a distinctly Wellsian flavour not only to The Secret Agent but also to “Heart of Darkness,” which bears traces of The War of the Worlds (1898) and The Time Machine. Dryden nicely points out the Wellsian significance of Marlow’s anecdote about the “Scotch sailmaker” who believed in life on Mars before broadening her analysis to suggest that Conrad’s use of techniques and tropes from science fiction “emphasizes the very ‘otherness’ of Africa […] as alien an environment as far-off Mars” (23). This is an important and suggestive observation – though Dryden might have made more of Conrad’s many allusions to Wells’s works throughout his career. For instance, The War of the Worlds – or at least the invasion-scare genre of which it is an outstanding example – may have inspired Marlow’s thought-experiment in “Heart of Darkness” concerning “a lot of mysterious niggers armed with all kinds of fearful weapons” descending on the road between Deal and Gravesend. In discussing The Secret Agent, Dryden’s focus is on the political differences between Wells and Conrad that it illustrates. However, quoting the novel’s closing sentences without pointing out the passage’s clear resemblance to the end of Wells’s short story “The Stolen Bacillus” misses a trick. More generally, both writers showed a fascination with the Malay Archipelago in their earliest stories, and a discussion of this (perhaps in the context of Alfred Russel Wallace) would have been productive. The most serious omission is that of Chance (1914), which in many ways shows Conrad at his most Wellsian – not the science-fiction Wells, but the Wells of Love and Mr Lewisham (1900), Kipps (1905) and Tono-Bungay. It is not just that the case of the swindler Whitaker Wright inspired both Tono-Bungay’s Teddy Ponderevo (whose name, incidentally, is consistently misspelled here as Ponderovo) and Conrad’s de Barral, or that Wells has been suggested as a model for John Fyne. Chance’s social criticism on topics ranging from gender – the subject of Wells’s Ann Veronica (1909) – to work and leisure (examined mythographically in The Time Machine) can be seen as a response to Wells’s sociological preoccupations: Chance’s pessimistic portrait of modern urban life offers a sceptical alternative to Wells’s faith in technological progress and political reform. Where Dryden’s book is at its strongest is in its examination of the aesthetics of the two writers. Conrad’s theory of literature is usually analysed in the context of impressionism and in relation to James, Ford and Crane. Dryden acknowledges this tendency before making a strong and convincing case for Wells as another formative influence, who helped drag Conrad towards a more economical style after the florid excesses of the early fiction. In other respects, the differences between them in aesthetic philosophy only grew, and these explain, Dryden persuasively argues, the breakdown in their relationship. Wells increasingly asserted that the novel should change the world for the better, and after 1909 (or thereabouts) became volubly impatient with his near-neighbours in Kent and East Sussex who insisted, in Ford’s words, that the novelist “must render: never report.” That said, Dryden is rather too absolute in characterising Wells as a predominantly polemical writer and Conrad as a pure impressionist: Wells’s early stories deploy some strongly impressionistic techniques, while Conrad is, most of us would agree, a master of political fiction – and not only in his overtly “political” novels like Nostromo and Under Western Eyes (1911). This rather monochrome analysis continues into the book’s final chapter on war and the emergence of Modernism, with Dryden suggesting that Wells embraced world war as a means to remake the world, while Conrad remained sceptical and aloof. War is a theme in Wells’s fiction from The War of the Worlds to The Holy Terror (1939), and he devoted a great deal of space in his polemical writing to the subject (famously coining the phrase “The War That Will End War” in the title of a 1914 pamphlet). His thinking on war was, to say the least, complex, ranging from the anti-German polemics of his war propaganda to the apocalyptic chill of his dystopian novel The War in the Air (1908). Conrad, meanwhile, may not have played as prominent a role in the propaganda effort as Wells (or, for that matter, Bennett, Ford, Chesterton, Conan Doyle, Kipling, Galsworthy et al), but he did contribute pieces such as “Well Done” and “Tradition” (1918), and joined a minesweeper and a Q-ship for short tours. Borys Conrad’s memory of Conrad’s excitement at seeing British warships in the Bay of Biscay – “never at any time do I remember him displaying greater emotion than he did on this occasion” – also demonstrates that Conrad was not simply a dispassionate and sceptical observer of hostilities. Dryden’s book covers a great deal of ground, much of which is new. Moreover, it demonstrates that what she calls “an inter-textual reading” can be highly productive, bringing in other figures (Ford, Stevenson, Kipling) to provide additional context. That there remain quite a few matters to discuss is testament to the rich and important topic that Dryden has chosen.